This rare coffee has the dubious distinction of being consumed before the customer has even taken a sip. 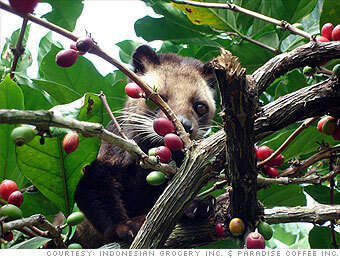 The palm civet, a cat-like animal also called a luwak, ingests fresh coffee cherries but doesn't digest the beans inside. After the beans pass through the civet's digestive system, workers collect them and wash them in spring water. Supposedly, the civet's digestive enzymes make the beans less acidic, improving the coffee's flavor. Peter Longo, owner of New York City's Porto Rico Importing Co., is drawn to all things exotic and novel, so when he first heard about civet coffee, he knew it would be perfect for his store: "It was right up my alley - such an odd and unique thing." Over the past six months, he's sold about 12 pounds of civet coffee, mostly in small quantities. He charges $50 for one-eighth of a pound, $90 for a quarter-pound, and $175 for a half-pound; each order is custom-roasted. Civet coffee may sound bizarre, but it's not just for the adventurous. "It's actually mild and smooth, with a piquant aftertaste," Longo says. "It's very good, as long as you don't let your imagination get the better of you." Prized - and pricey - ham arrives in U.S.
Would you eat 2,900-calorie cheese fries?